The Thermos brand is well known as the quality and performance leader in insulated food and beverage products. The Stainless King series creates a new chapter in Thermos' storied history with a modern line that blends out newest technology with a dash of the past. Constructed with double wall stainless steel, this 16 ounce travel tumbler is virtually unbreakable, yet its sleek design is both eye-catching and functional. The contoured body shape is easy to grip and fits most automobile cup holders. For tea drinkers, a built-in tea hook is just the ticket to brew tea on the go. The tea hook can also accommodate most loose leaf infusers. In order to maximize the incredible insulation technology, it is recommended to either pre-chill or pre-heat the travel tumbler just prior to use. This can be accomplished by filling the tumbler with cold or hot tap water, attaching the lid and letting it rest for a few minutes. Before you are ready to use, simply empty the water and fill with your favorite beverage. 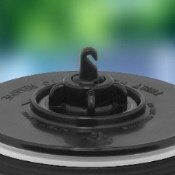 Attaching the lid will further increase the thermal efficiency. 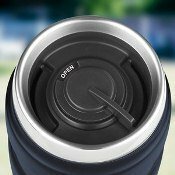 The Stainless King Travel Tumbler comes equipped with a 100% leak-proof DrinkLock sealing lid which operates simply by pushing the lever 45 degrees right or left to open and close. And because of the double wall insulation, the stainless steel body stays cool to the touch with hot beverages and condensation-free with cold beverages. The Stainless King Vacuum Insulated Travel Tumbler is made of BPA-free materials.